The most important determinant of a country’s competitiveness is its human talent—the skills and productivity of its workforce. Similarly, an organization’s performance is determined by the human capital that it possesses and its ability to use this resource efficiently. Ensuring the healthy development and appropriate use of half of the world’s available talent pool thus has a vast bearing on how competitive a country may become or how efficient a company may be. There is clearly also a values-based case for gender equality: women are one-half of the world’s population and deserve equal access to health, education, economic participation and earning potential, and political decision-making power. Gender equality is thus fundamental to whether and how societies thrive. 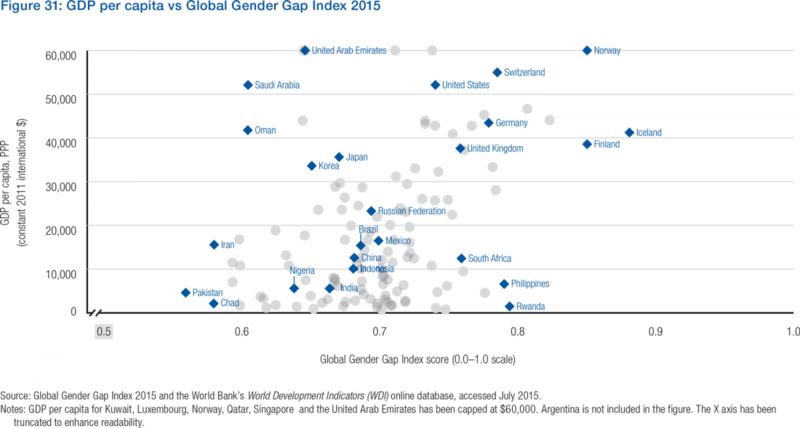 Figure 31 demonstrates the relationship between GDP per capita and the Global Gender Gap Index 2015. Figure 32 shows the links between the Human Development Index 2014 and Global Gender Gap Index 2015 and Figure 33 illustrates the links between the Global Competitiveness Index 2015–2016 and Global Gender Gap Index 2015. The graphs confirm a correlation between gender equality and GDP per capita, the level of competitiveness and human development. 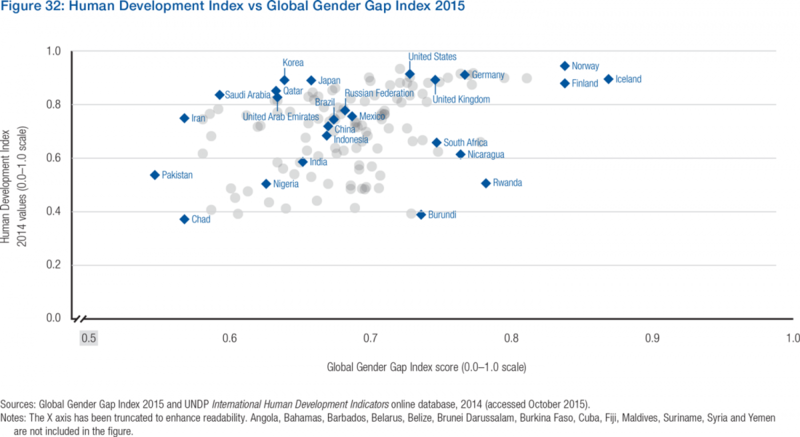 The correlation is evident despite the fact that the Global Gender Gap Index (unlike other gender indexes) explicitly eliminates any direct impact of the absolute levels of any of the indicators used in the Index (e.g. life expectancy, educational attainment, labour force participation), as these may be impacted by the relative wealth of a country. While correlation does not prove causality, it is consistent with the theory and mounting evidence that empowering women means a more efficient use of a nation’s human capital endowment and that reducing gender inequality enhances productivity and economic growth. The Global Gender Gap Index takes into account four critical areas when measuring the gaps between women and men’s access to resources and opportunities. For each of these areas, there are economic or societal gains from increased gender parity. This section summarizes some of the key research findings on the broader economic and societal case for gender equality. Figures 34 through 39 display some of the key relationships. There is also a growing business case for gender diversity. As women become more economically independent, they also become more significant consumers of goods and services, including for the majority of purchasing decisions of the household. Research has also shown that women are more likely than men to invest a larger proportion of their household income to the education and health of their children. The combined impact of growing gender equality, the emerging middle class and women’s spending priorities is expected to lead to rising household savings rates and shifting spending patterns, affecting sectors such as food, healthcare, education, childcare, apparel, consumer durables and financial services.21In nearly 100 countries women now account for more than half of the college and university graduates. As they begin to take up half of entry-level positions in several industries—in several OECD countries, for example—it is a loss for companies if these highly skilled women are forced to choose between work and family at later stages of their career.22Additionally, in a highly interconnected and rapidly changing world, organizations and countries must adapt strategies and innovate in order to remain relevant and competitive, augmenting the need for the creativity fostered by diversity.23Diversity is also critical to informed decision-making. 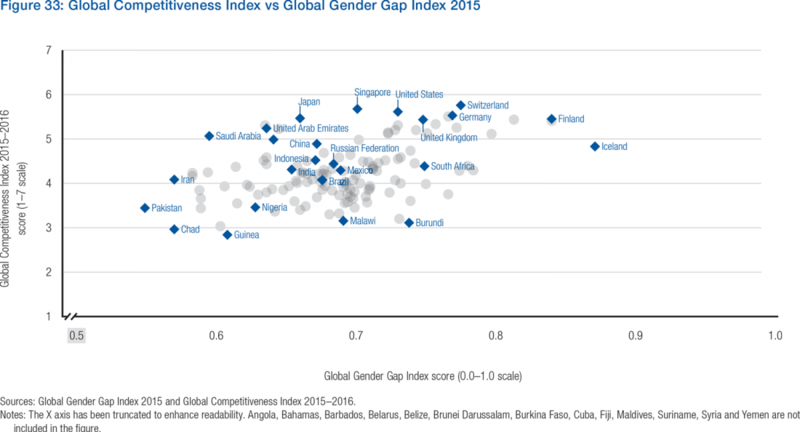 The Global Gender Gap Index helps reveal which countries are relatively strong or weak at integrating female talent in the economy. 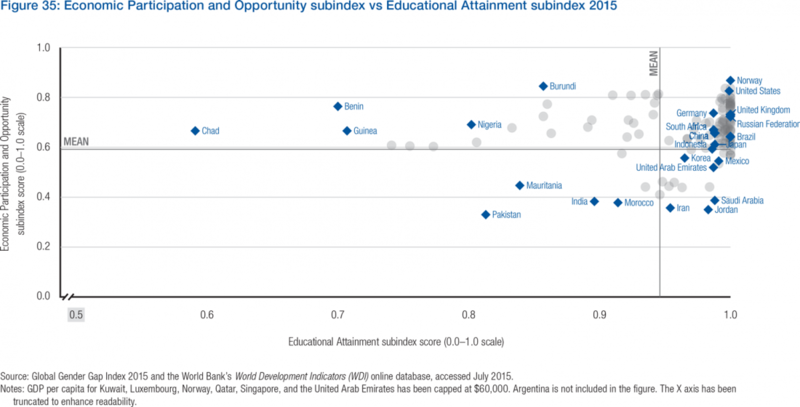 Among the 145 countries covered, almost 95% of the gap in educational attainment has been closed. In nearly 100 of these countries, women make up the majority of those in tertiary education. This means that, though countries are ideally poised to maximize opportunities for women’s participation in the labour market, many have failed to reap the returns from this investment. 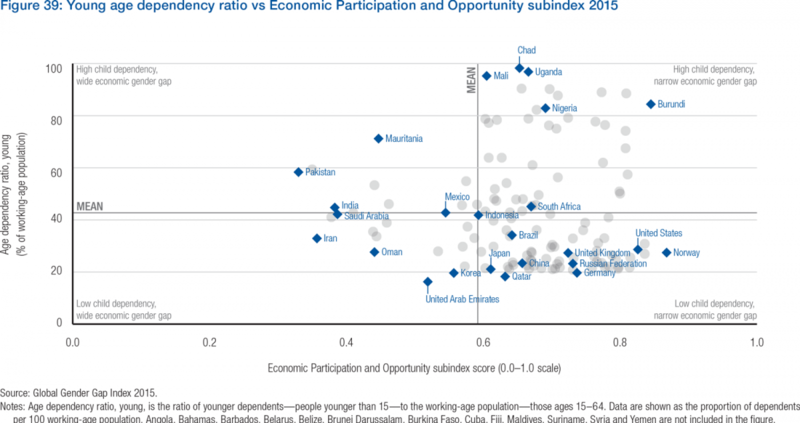 In Figure 35, we plot the Educational Attainment subindex against the Economic Participation and Opportunity subindex, while Figure 36 specifically focuses on G20 countries. The data reveals four broad groups of countries: (1) countries that have closed or are generally closing education gaps and show high levels of women’s economic participation, (2) countries that have closed or are generally closing education gaps but show low levels of women’s economic participation, (3) countries that have large education gaps as well as large gaps in women’s economic participation and (4) countries that have large education gaps but display small gaps in women’s economic participation. In the first broad group are countries that have made investments in women’s health and education, and generally see the returns on this investment in terms of women’s economic and political participation. These countries include the Nordic countries, the United States, the Philippines, Canada, New Zealand and Australia. 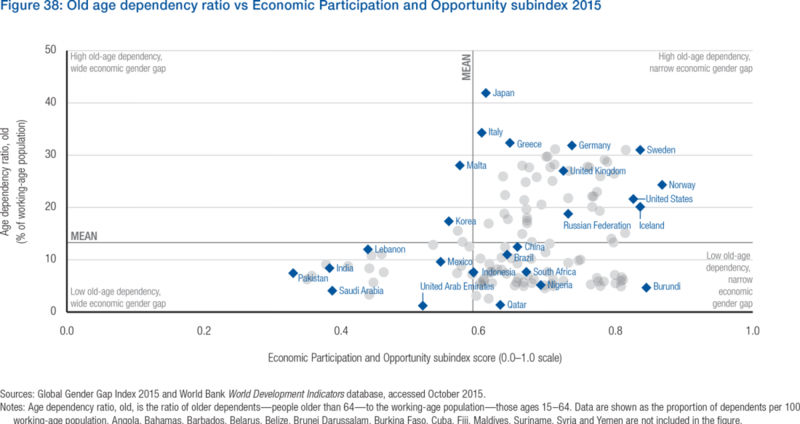 These countries have not, however, fully closed economic and participation gaps—in particular, the gaps in senior positions, wages and leadership levels still persist. In the second broad group are countries that have made key investments in women’s education but have generally not removed barriers to women’s participation in the workforce and are thus not seeing returns on their investments in the development of one half of their human capital. This group includes Japan, United Arab Emirates, Chile and Brazil. These countries have an untapped but educated talent pool and would have much to gain through women’s greater participation in the workforce. In the third and fourth groups, the most basic investments in girls’ and women’s education still need to be made, and fundamental rights—including legal frameworks around inheritance, reproductive rights and violence—are often inadequate. The third group contains countries such as Yemen, Pakistan, India, and Mauritania that have large education as well as economic gender gaps. The fourth group contains countries such as Guinea, Chad, Mozambique and Burundi, which have large education gender gaps but small economic ones, primarily due to high levels of participation by women in low-skilled work. Compared with the third group, women in these countries have greater access to income and decision-making. However, a substantial body of literature has shown that investing in girls’ education is one of the highest-return investments a developing economy can make—and, for these countries, closing education gaps will remain an important factor over time. 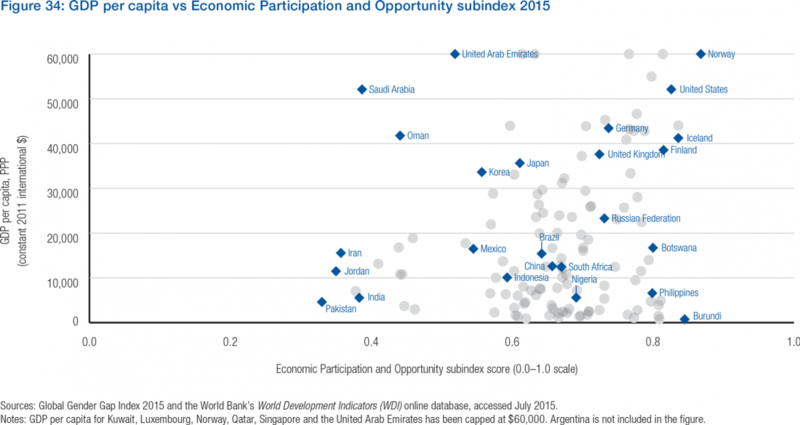 Finally, demographic changes are added drivers for women’s economic participation. For example, in ageing economies, as labour forces shrink and talent shortages emerge, women’s integration into the economy is key to promoting dynamism. In countries where it is relatively easy for women to combine work with having children, female employment and female fertility both tend to be higher. Policies that allow women to combine work and family may thus play a role in addressing the future problems posed by ageing populations.27A study has shown that closing the gap between male and female employment would boost Japanese GDP by as much as 16%. Figure 38 shows the old-age dependency ratio (as a percentage of the working age population) plotted against the economic gender gap, while figure 39 should the young-age dependency ratio (as a percentage of the working age population). 8 See the Global Gender Gap Report 2013. 9 ILO and ADV. “Women and labour markets in Asia – Rebalancing for Gender Equality”, 2011. 10 Jad Chaaban and Wendy Cunningham, “Measuring the Economic Gain of Investing in Girls: The Girl Effect Dividend”, World Bank Policy Research Working Paper, World Bank, August 2011. http://elibrary.worldbank.org/doi/book/10.1596/1813-9450-5753. 11 David E Bloom, David Canning and Jaypee Sevilla, “The Effect of Health on Economic Growth: A Production Function Approach”, World Development, Vol. 32, No. 1, pp. 1–13, 2004. (http://www.ppge.ufrgs.br/giacomo/arquivos/eco02072/bloom-canning-sevilla-2004.pdf). 12 Karl Wilhelmson and Ulf-G Gerdtham, “Impact on Economic Growth of investing in maternal and newborn health”, World Health Organization, 2006. 13 OECD. “Women, Government and Policy Making in OECD Countries - Fostering Diversity for Inclusive Growth”, 2014. 14 See Beaman et al., “Powerful Women”. 15 Munshi and Rosensweig, “The Efficacy of Parochial Politics”. 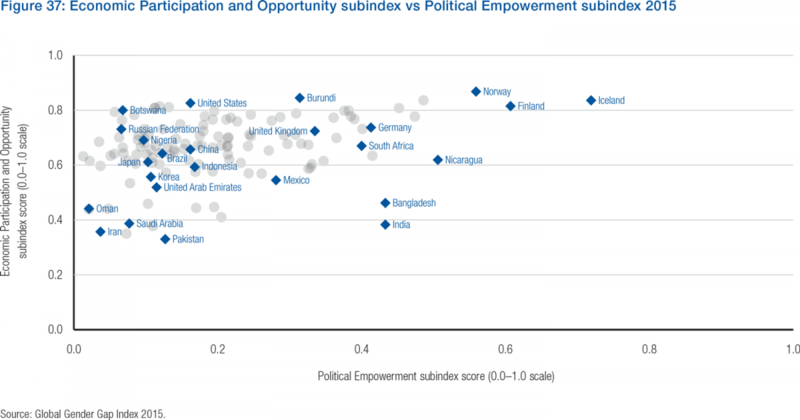 16 Ejaz Ghani, Anandi Mani and Stephen D. O’Connell, “Can Political Empowerment Help Economic Empowerment? Women Leaders and Female Labor Force Participation in India”, World Bank, Policy Research Working Paper 6675, Oct 2013. 17 McKinsey, “Unlocking the full potential of women in the U.S. economy 2011”. 18 See Daly, “Gender Inequality, Growth and Global Ageing”. 19 ILO and ADV. “Women and labour markets in Asia–Rebalancing for Gender Equality”, 2011. 20 See World Bank, “Gender and Development in the Middle East and North Africa”. 21 Goldman Sachs Global Markets Institute. “The Power of the Purse”. 22 See Ibarra and Zahidi, The Corporate Gender Gap Report 2010. 23 Lauren Leader-Chivee, “New Study: Diversity Drives Serial Innovation”, October 2013 and Deloitte, “Waiter, is that inclusion in my soup? A new recipe to improve business performance”, 2012 (http://www.deloitte.com/assets/Dcom-Australia/Local%20Assets/Documents/Services/Consulting/Deloitte_Diversity_Inclusion_Report_V4_Nov_2012.pdf). 24 McKinsey & Company. “Women Matter 2013”. 25 Jeremy Galbreath, Are there Gender-Related Influences on Corporate Sustainability? A study of women on Boards, Journal of Management & Organization, Vol 17, No 1 (2011). (http://espace.library.curtin.edu.au/R/?func=dbin-jump-full&object_id=158930&local_base=GEN01-ERA02). 26 Credit Suisse Research Institute. “Gender diversity and corporate performance”, 2012. 27 Daly, “Gender Inequality, Growth and Global Ageing”.